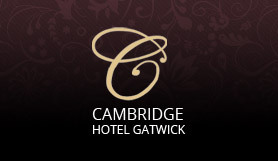 The Gatwick Cambridge Hotel is precisely 2.9 miles from Gatwick airport and a 6 minute drive. It is located conveniently close to Horley (near Gatwick) and can be accessed from the M23 motorway. The hotel itself is a luxury, listed building and a 4-star hotel with a Mediterranean restaurant, free wifi throughout, a bar, 34 well equipped en-suite rooms and family rooms are also available. Its Airport Parking facility offers piece of mind, with high tech security gadgets including security camera, alarms, fencing, barricades and 24 hour security. A 24 hour shuttle is in operation running to and from Gatwick Airport and taking up to 10 minutes only. Gatwick Airport serves over 43 million passengers each year and as it continues to grow, good quality Airport Parking is becoming more and more in demand. You can book your Gatwick Parking space here through Looking4.com at a great price and be assured a quality, and stress free experience. Simply book online now to ensure the best price and please note that prices can change from time to time as demand increases. Car park doesn't accept Vans, Mini bus, camper vans, commercial vehicles. Additional cost:Transfers cost £3 per person each way. The mini bus operates on a first come, first served basis. Please go to reception, fill in the form and and hand your key. Please call number provided on the confirmation email to inform you need picking up. North Terminal pick up point - Bus stop 12 ground floor. South Terminal pick up point - Bus stop 9 ground floor. Cambridge Hotel. 19 Bonehurst Road, Horley,Surrey, RH6 8PP.